Here is where I come to realize that reading and comprehending are often further apart than one might think. Believing the stories that goats make excellent ‘brush hogs’, I acquired two on September 7 with the idea that I could use them to graze back the Himalayan blackberry thickets that pervade the back 20. Prior to getting them, I read selected websites written by experienced handlers who spoke of the differences between sexes, what vaccinations are necessary, and what they should and should not eat. A price was paid for the goats, and the associated accoutrements, including durable rubber tubs, goat feed, loose salt, leads, collars, and a galvanized bucket for milking the doe that had recently weaned a kid. Money and time was also put into a shed my father built, and a fence that we worked to put up as a small holding pen. The first day, one crawled under the fence. The second day, they learned to jiggle the latch and open the gate. 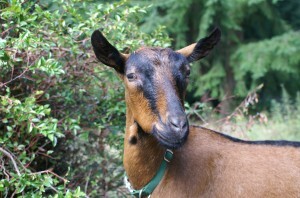 By the end of the first week, I had learned why people told me that staking out was not such a great idea for goats. Tied to tires, tree trunks, or fence posts, together or separately, it mattered not. Within the hour, slender legs were hopelessly entwined with rope or cable, or the ropes were wrapped a dozen times around tree trunks, pallets, or clumps of fern. Every few hours I was out disentangling them. Trying my hand at goat psychology, I let them run loose. Given 19 acres of woods and blackberries, they chose my garden spread by the house every time. They nipped off the dahlia heads, peed on the sidewalk, and tumbled pellets in the driveway. Perplexed, I went back to staking them out for partial days after I’d finished my morning work. One morning as I walked out to feed them, I was greeted by the site of a goat eating my newly planted blueberries by the garden. Eagerly they bolted towards me, and as I opened the gate to the shed saw the hole that they had hammered out of the side. 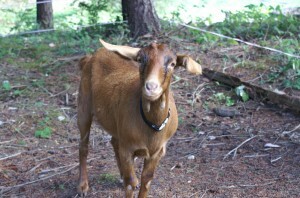 One goat gave me a quick tour of her escape route by nimbly re-enacting her escape. They seemed altogether pleased with themselves. So, I paid for a fence, about 1,000 feet worth of three-strand ½ inch polytape electric fence. Yesterday when we hooked up the charger, I was elated. The charger ticked. The goats stood looking at the strands from a safe distance, then proceeded to graze their new area without further investigation. At last, I could again focus upon my landscaping without spending half of the day chasing or untangling goats. No sooner did I pronounced the design a success then Daisy took a run at the three – strand hotwire gate and ran beneath it brushing the wire with her back without incident. Giving her a sample shock on the fence yielded only temporary results. They respected the fence until feeding time when they again filtered through the fence to return the pen. This might all be worth it if they were indeed the non-discerning little brush eaters that they have been made out to be, but they’re not. They eat a bit like a bored teenage boy; a bit of this, a bit of that, move on leaving the rest unfinished. They like blackberry leaves but not the stems, ignore thistles and huckleberries, adore Douglas fir branches, and eat grass only sporadically. Much of the afternoon is spent lying about cud chewing. My father, gazing out over an area of tall grass and briars suggested leveling it out with the excavator. Avoiding the tendency to roll my eyes and slap my forehead, I patiently explained that the reason for buying the goats was to avoid undue soil disturbance by letting them graze through those areas. Not that I’m convinced anymore by the argument. I have visited the isle of Crete and saw the vegetation leveled by goats. But that took legions of the hoofed animals and hundreds if not thousands of years of human occupation to accomplish. With these two attention-deficient animals, I may not even get a single paddock cleared.